Mmmm I have mentioned before that I love my chinese food right? There is just something about dishes like this that help me forget that I’m trying to eat low calorie and low fat. I love that feeling after eating nummy dishes like this and realizing that I have just eaten healthy instead of naughty. It feels naughty…but its nice. So easy to make too! Really do we need take out plumping us up when we can make stuff like this? 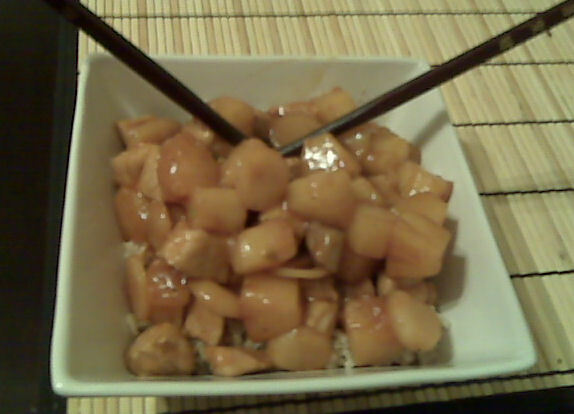 Mix the flour, water, vinegar, sugar, ketchup, and soy sauce in a bowl and set aside. Heat a wok or large skillet over medium heat. Spray the pan and add the pork. Stir-fry until almost cooked through, about 3 minutes. Add the ginger and garlic. Stirfry until fragrant. Add the pineapple and water chestnuts. Cook for 4 more minutes. Add the sauce. Cook while continuously stirring until the mixture boils and thickens. Check the pork, when it is cooked though you are done! Makes four servings. Each serving has 377 calories, 9 grams of fat and 3 grams of fiber. I served this on a portion of brown rice. I tried out the new multigrain minute rice brown rice tonight. It works out wonderfully! It was really easy and tasty. It is so hard to get brown rice just right, hopefully this new easy brown rice will help folks eat more brown rice. I know its going to help me! This entry was posted in Dinner and tagged Pork. Bookmark the permalink.